Status: still developing, but is working. More features comming. The project is a specialized communications program designed to issue commands to a USB Bit Whacker. Input format is specialized to make input easy. I/O direction is specified in binary to make it clear what the function of each pin is. A complete log of activity is provided both to the screen and to a log file. Inputs are on the left hand side of the screen, fields have a white background. Buttons are in the middle. Outputs are on the right, fields have a gray background. (b) binary, eight characters 0's and 1's as 00101111. (d) decimal, a normal decimal number. Has most of the general features of RS232/USB Probe but specialized to the BitWacker, there are special fields for input and output which are treated as the most appropriate data type: for example the io configuration of a port is entered in binary for easier understanding of the input. The buttons remember the command string and formats up the command string ( after validating the inputs ). Does not support the bulk commands, support is for the commands with a single response. Checks for and reports BitWacker errors. Closes the comm port and exits the application. These commands are fairly direct implementations of the basic command set of the BitWacker. The interface does change format of the input. For example in configuring the IO ports binary seems easier than decimal. No input, no output, should just work. Output: ( Field Version ) is the version response from the BitWacker. 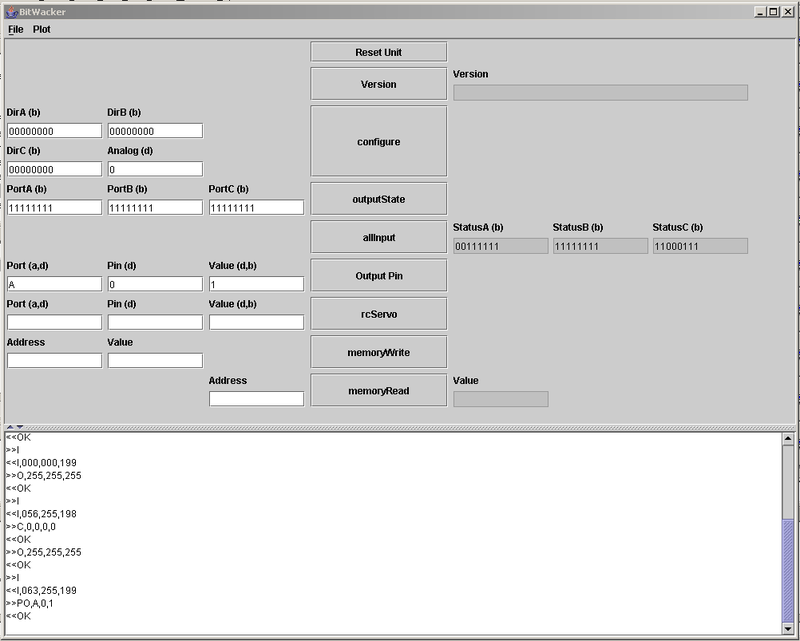 Input: 4 Fields, 3 Fields( binary ) for the direction of PortA, PortB, PortC ( 1 is input, 0 is output. ), and one input for then number of Analog channels ( 0 to 12 ). 3 inputs, one field for each port. Binary input 1 for output high, 0 for output low. Input: Output one field for each port, binary. Inputs: Port Field ( use either decimal numbers 0, 1, 2, or A, B, or C). Pin Field, use decimal number 0 to 7. State 0 or 1 ( could be in any base, how can you tell? ). Input:2 Inputs. Port use either decimal numbers 0, 1, 2, or A, B, or C. Pin, use decimal number 0 to 7. Output: State of pin; 0 or 1. Input: Address to be written to. Value to be stored in the address. Input: Address to be read. Output: Value stored in the address. This page was last modified on 18 June 2008, at 17:48.